I am loving the abundance of Autumn produce available right now. My next few posts will be featuring the array of fresh fruit and vegetables which have been inspiring my food choices lately. First up are pears and apples. 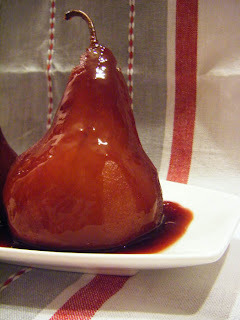 This pear recipe is one I have been wanting to try for a while. I found this one in Delia Smith's 'Winter Collection'. I have been revisiting her books of late as there has been much consternation over her latest cookbook 'How to Cheat at cooking'. Many have commented that it is a serious departure from the Delia we know and love and although I haven't seen the book, it doesn't sound like it is one I will be adding to my collection either. I grew up watching Delia on tv, and along with Alison Holst they were two guiding lights for me in all things cooking. Although both were a little 'fusty' they were also very reliable, long before cooking became cool they were teaching us the basics and encouraging us to try something a little more adventurous. I like Delia's classic style, she does all those comforting favourites so well. I think I will be using her books alot this winter! The original recipe is for Pears in Marsala wine, but Delia suggests using red wine or cider as an alternative. I used the red wine and it turned out just perfectly. Ridiculously simple and yet stunningly flavoursome. It needs a while on the oven, but with the nights turing cooler, this isn't a problem as it keeps things lovely and cosy! 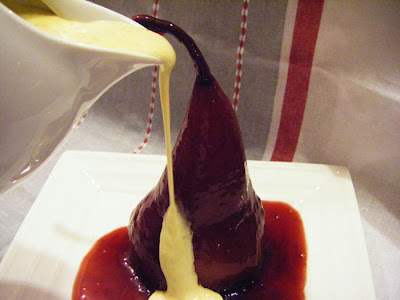 I used the full syrup recipe to go with 3 enormous pears (we are very greedy! 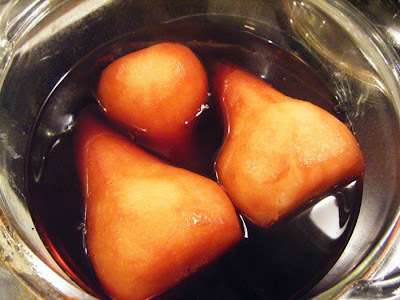 ), there was lots of syrup left over so a few more pears could have been used! To serve with this I made Delia's gorgeous vanilla custard, which was sublime! So easy and the addition of cornflour makes it a no fail exercise. My kind of cooking! You will also need a large flameproof casserole with a tight-fitting lid. Using a potato peeler thinly pare off the outer skin of the pears, but leave the stalks intact. Then slice off a thin little disc from each pear base so they can sit upright. Now lay the pears on their side in the casserole. Pour in the Marsala then sprinkle over the sugar and add the cinnamon sticks and vanilla pod. Now bring everything up to simmering point, then cover the casserole and bake the pears on a low shelf in the oven for about 1½ hours. After that remove the casserole from the oven, turn the pears over on to their other side, then replace the lid and return them to the oven for a further 1½ hours. When the pears are cooked, transfer them to a serving bowl to cool, leaving the liquid in the casserole. Then remove the cinnamon sticks and vanilla pod. Place the casserole over direct heat and then, in a cup, mix the arrowroot with a little cold water until you have a smooth paste. Add this to the casserole, whisking with a small whisk as you add it. Bring the syrup just up to simmering point, by which time it will have thickened slightly. 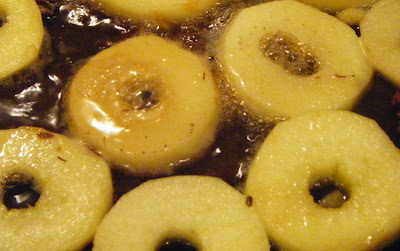 Then remove from the heat and when the syrup is cool, spoon it over the pears, basting them well. Begin by splitting the vanilla pod lengthways and using the end of a teaspoon to scoop out the seeds. Then place the pod and the seeds in a small saucepan, along with the cream. Now place the pan over a gentle heat and heat it to just below simmering point. While the cream is heating, whisk the egg yolks, cornflour and sugar together in a medium bowl using a balloon whisk. Next remove the vanilla pod from the hot cream. 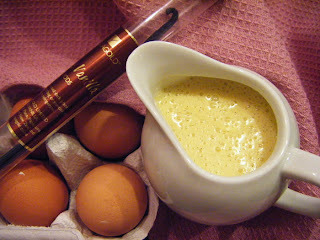 Then, whisking the egg mixture all the time with one hand, gradually pour the hot cream into the bowl. When it's all in, immediately return the whole lot back to the saucepan using a rubber spatula. Now back it goes on to the same gentle heat as you continue whisking until the custard is thick and smooth, which will happen as soon as it reaches simmering point. If you do overheat it and it looks grainy, don't worry, just transfer it to a jug or bowl and continue to whisk until it becomes smooth again. Pour the custard into a jug or bowl, cover the surface with clingfilm and leave to cool. To serve it warm later, remove the clingfilm and sit the bowl over a pan of barely simmering water. We are so lucky in New Zealand to have the most delicious array of both fruits on our doorstep, my children adore Gala apples whereas I prefer the tarter Braeburn. I buy a bag of each to keep us all happy and often end up using the Braeburns for a quick dessert. This is a fabulously quick dessert which I found in the NZ Taste magazine, the apples are poached in white wine this time! 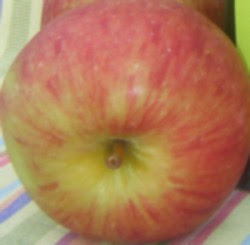 Core each apple and cut into 1cm-thick slices. In a large frying pan warm together the sugar, wine and cinnamon stick. Add the apple rings and cook for 2 minutes on each side. Take the apple rings out of the pan and set aside. Continue to cook the liquid until it becomes a syrup (about 3-5 minutes). Return the apples to the pan and cover with syrup. Discard cinnamon stick and serve apples warm or chilled with vanilla icecream or honey floavoured yoghurt. No wonder those fabulous pears made it on to Tastespotting they are gorgeous, mind you all of your food is amazing. btw, I've tagged you, check out my blog. Thank you for choosing fruit and vegetables.I like it very much .Your Photos are so nice. Poached fruits are a great way to end an autumn meal. My better half prefers fruit and I am only ever happy to oblige. 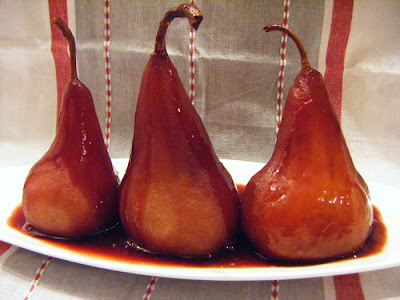 Pears done in icewine (I sub a late harvest to save on $$) and finished with best dark bitter chocolate sauce. Masala and custard are a nice combination, must try. Lovely photos. 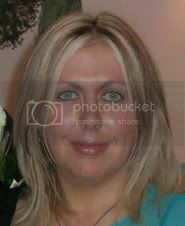 Linda, I'm so impressed with your blog, it's going great!